We’d love your help. Let us know what’s wrong with this preview of The Lives Before Us by Juliet Conlin. To ask other readers questions about The Lives Before Us, please sign up. The Lives Before Us is an accomplished, poignant and gracefully compelling story. A story steeped in history but personalised through the characterisation and life of 3 main characters, Esther, Kitty and Yì. Juliet Conlin has written a story conveying a sense of constant upheaval and a struggle to survive, during one of the World’s darkest periods. When hopes and expectations would remain dreams and a harrowing life was all that awaited the victims of a World at war. I read The Lives Before Us as a Buddy Read with my great friend, Beata. Many thanks for her contribution and insight while we read this together. Beata made this such an enjoyable experience, which is another memory I have of this book. I would highly recommend this book and I would like to thank Black & White Publishing and Juliet Conlin for providing me with an ARC version in return for an honest review. JanB Buddy reads are just the best - great review! Peter JanB wrote: "Buddy reads are just the best - great review!" It was my first Buddy read and such a wonderful experience, you obviously love them too. Th JanB wrote: "Buddy reads are just the best - great review!" This is an interesting novel describing the fate of the Jewish immigrants who were lucky to leave Germany and Austria before WW2 began. The immigration, as it turned out, saved their lives. The destination place was Shanghai, one of the few places then that accepted Jews and where the immigrants lived or rather survived in most dramatic circumstances. Two female characters, Kitty and Esther, have different background and stories that they take when they embark the ship. I liked the way the autho This is an interesting novel describing the fate of the Jewish immigrants who were lucky to leave Germany and Austria before WW2 began. The immigration, as it turned out, saved their lives. The destination place was Shanghai, one of the few places then that accepted Jews and where the immigrants lived or rather survived in most dramatic circumstances. Two female characters, Kitty and Esther, have different background and stories that they take when they embark the ship. I liked the way the author unveils gradually both women's past as it makes the novel intriguing. In Shanghai they face difficulties, poverty, fear, loneliness but somehow find stamina to survive. They are complete opposites, moreover, Esther has a little daughter to take care of. Kitty's and Esther's paths cross that of a poor Chinese boy's called Yi. Introducing Yi allows the Author to describe daily lives of average Chinese under Japanese occupation of which I had only a vague idea. There is so much to learn from this novel about the immigrants whose fate took them so far away from homeland, forcing them to leave the nearest and dearest for the price of survival. Many books have this theme but the setting for this novel was a total novelty for me and the panorama of the immigrant community in the Chinese port is interestingly presented. I especially enjoyed vivid descriptions of Shanghai and I actually could hear the noise and smells of it. The Lives Before Us is a solid historical fiction that I recommend to the fans of this particular genre. Reading this novel was a double pleasure as it was my first ever Buddy Read with my Great Friend Peter, whose thoughts added wonderfully to my reading experience. April 1939 German widower Esther Niermann and her little daughter Anneliese and Austrian Kitty Blume are both Jewish and fleeing their respective countries before the war breaks out. They know of what Hitler and his men will do to the Jewish people. They meet on board a ship heading from Genoa to Shanghai, China when they are both given the same cabin to share for the eight-week journey. The crossing is rough and sickly but the two women become firm friends. Once they dock the pair are separated and whilst Esther and Anneliese go to the Jewish refugee compound set, Kitty is supposed to be starting a new life with her fiancé, Vitali, who is waiting for her but not everything goes according to plan. She is given the help of a young Chinese servant boy called Wing (Yi) who is to look after her. The book follows their lives over the coming years, up until the end of the war. They might have thought that Shanghai was the answer to their prayers but they didn’t count on the Japanese and the hardship that was to follow. The book is told in alternating chapters, at first between Esther and Kitty and once they are in Shanghai, Wing is an additional added character. Their stories are written in the third person and via short chapters. Each of the characters including little Anneliese had their own personalities and their hardship and toughness of living through the war really came across strong. The two women were both very strong women. Esther has had to leave her loving family behind. Her parents paid for her and their granddaughter to get out of Germany and to hopefully make something of their lives. She is holding a lot of guilt regarding the death of her husband and now the only family she has is her daughter and she will fight tooth and nail for her. Kitty reminded me of the women you see in 1920’s movies, those who are dressed up to the nines and drink cocktails and have men falling at their feet. She hasn’t had anything to do with her family in many years as her father was a monster who was partly responsible for the death of her sister. She’s a woman who puts on a brave face and gets on with things, even when she is scared inside. Wing (Yi) is a young boy cared for by his grandmother, his parents are dead. He wants to make enough money to give his grandmother a home that they can share together. This is a story that is so poignant, heartwarming, and touching. It really moved me listening to the characters stories. The vivid descriptions are so well crafted that you will be able to perfectly visualise what is happening, including all the barbaric and distressing events. The book also educated me. I remember a lot about what I learned about the Second World War but I’d never heard of Jewish people seeking refuge in China or the ghettos. I knew that I would fall in love with this book as soon as I had read the first few pages and I sat about for a long while once it was over, wondering how on earth my review could do this book justice. This is historical fiction at its very best; a moving journey with two strong and brave yet strikingly different women at its heart, entwined with the life of a young boy from Shanghai. Whilst reading, my senses were assaulted by a cacophony of sights, sounds and smells; I really felt as if I was I knew that I would fall in love with this book as soon as I had read the first few pages and I sat about for a long while once it was over, wondering how on earth my review could do this book justice. This is historical fiction at its very best; a moving journey with two strong and brave yet strikingly different women at its heart, entwined with the life of a young boy from Shanghai. Whilst reading, my senses were assaulted by a cacophony of sights, sounds and smells; I really felt as if I was positioned right in the centre of the Shanghai Ghetto; inhaling its squalor and destitution as an onlooker standing at a window over Kitty, Esther and Wing. I found my heart breaking for both Esther and Kitty in very different ways; it seemed that they were both bombarded with setback after setback and every time they managed to overcome the challenges hurled at them, they would be dealt yet another crushing blow. The enduring tenacity and the strength of these two women, who were entirely alone, combined with the kindness of those who let them into their lives, often with less than little to give, left me feeling both a sadness and a happiness at the sense of camaraderie which emerged from their collective struggle in the toughest of times. For me, this novel was an education in an area of the Second World War of which I have very little knowledge, and on which I have read very little. The rawness of the effect of poverty in the Shanghai Ghetto evoked by Conlin, was for me a shocking revelation. The instability and precariousness of Wing’s entire existence was at best unsettling and at worst truly tragic. I found myself heavily invested in his survival as well as that of Kitty and Esther. Conlin’s depth of knowledge and expertise on the plights of those affected by the Second World War is obvious throughout the book. I am reliably informed (straight from the horse’s mouth so to speak!) that she embarked upon a veritable quest to perfect this novel, including learning basic mandarin and travelling 5000 miles for research, not to mention personally interviewing Shanghai Ghetto survivors and reading countless history books on the subject. This is a compelling story of heartbreak, instability and compassion; a beautifully written and captivating tale of survival. Conlin presents a masterclass in historical fiction in what is a sensorially astounding and truly accomplished novel. I shall be talking about this 5* story for a long time. 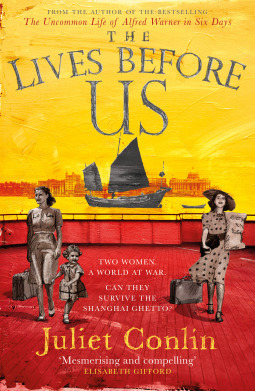 The Lives Before Us is the story of Kitty and Esther, Jewish women fleeing Vienna and Berlin as World War 2 threatens and they face being sent to live in ghettos or worse. Shanghai is one of the few places which still accepts refugees at this point and the women meet when they share a cabin on board the boat there. Esther is a widow, seeking sanctuary for herself and her young daughter Anni. Kitty is travelling to join her wealthy, Russian fiancee Vitali who has promised a life of luxury. Howeve The Lives Before Us is the story of Kitty and Esther, Jewish women fleeing Vienna and Berlin as World War 2 threatens and they face being sent to live in ghettos or worse. Shanghai is one of the few places which still accepts refugees at this point and the women meet when they share a cabin on board the boat there. Esther is a widow, seeking sanctuary for herself and her young daughter Anni. Kitty is travelling to join her wealthy, Russian fiancee Vitali who has promised a life of luxury. However, life in Shanghai turns out to be very different from what either of them expected. I loved this World War 2 era book, set in the exotic city of Shanghai, which follows the lives and adventures of three very different people. In Nazi occupied Europe in 1939 escape routes for Jews are few and far between. Esther and her young daughter are fleeing and one of the only cities that is still a free port open to all nationalities is Shanghai, so they board an ocean liner in search of a safer future. Once on board they meet Kitty, also Jewish, who is travelling to Shanghai on the promi I loved this World War 2 era book, set in the exotic city of Shanghai, which follows the lives and adventures of three very different people. In Nazi occupied Europe in 1939 escape routes for Jews are few and far between. Esther and her young daughter are fleeing and one of the only cities that is still a free port open to all nationalities is Shanghai, so they board an ocean liner in search of a safer future. Once on board they meet Kitty, also Jewish, who is travelling to Shanghai on the promise of a life of wealth and luxury with her Russian suitor. However once she arrives, she learns that she will be hidden away as a mistress, her only companion the young houseboy Yi. Despite this unpromising start she seems to be settling in , but as the Russian's angry and violent side comes to the surface she soon finds herself scraping a living working as a dance hall girl. As the war drags on, and the Japanese enter the fray, the dangers the women fled from seem to be following them. Strong characters, vividly described , are at the heart of this wonderful book. It is difficult not to feel sympathy for each of the three narrators in their different but difficult circumstances. The city of Shanghai almost feels like another character. Books set during this period are always fascinating, but this is the first I have read set in Shanghai and I really enjoyed the different perspectives and experiences described. despite their sometimes brutal and harrowing nature. The author does not shy away from the barbaric side of war, and the violence and depravity imposed on civilians living in a war zone which makes for difficult reading at times, but she also shines a light on the value of friendship and the importance of looking out for those we love. Two women. A world at war. Can they survive the Shanghai Ghetto? The Lives Before Us is the latest novel from Juliet Conlin and has just been published with Black & White Publishing. It is a book that invoked such emotions as the characters came alive for me. I travelled across the world with them and followed them into this new and strange environment where their lives would be changed forever. I had never heard of the Shanghai Ghetto, until now. In the late 1930s, Shanghai was categorized a Two women. A world at war. I had never heard of the Shanghai Ghetto, until now. In the late 1930s, Shanghai was categorized as a free port, allowing access to the country without visa or passport. With the persecution of the Jewish community already a reality, many made the long journey from the port of Genoa to the heaving and overwhelming city of Shanghai in the hope of a better life than the alternative. As the Nazi regime took a foothold in Europe, the choice for many of the Jewish community was exile to this strange land. Esther and Kitty, both young women in their prime, flee their homes in Berlin and Vienna for a better life, a chance to survive, to live. Esther has her young daughter to care for, following the death of her husband. Leaving her parents behind, her intention is for them to follow her as soon as she establishes herself in Shanghai. Kitty leaves Vienna chasing a dream, with her beau gone ahead of her, setting up their home for when Kitty arrives. With rumours aplenty that Shanghai is a haven, a place welcoming of the Jewish community, they journey with a sense of optimism about this new life. But after weeks of a treacherous sailing, they are soon faced with a very different reality, on arrival into this strange place. Esther and Kitty start their journeys in Shanghai on two very different paths. We witness the horrors they both face as they try to navigate this extraordinary place, with a culture so different to their own. Adding to the increasing challenges they both face, is the arrival of the Japanese military, who invoke a much stricter regime for the Jewish community, with the formation of a restricted section for ‘Stateless Refugees’. Known as the ‘Shanghai Ghetto’, it was a compact area in the Hongkew district of Japanese-occupied Shanghai and it became home to the Jewish community, until 1945. The Lives Before Us is a novel that was inspired by real-life testimonials, diaries, essays and Juliet Conlin’s interviews with survivors of the time. Described as ‘a story of survival, community, exile and friendship’, it brings the reader on an extraordinary voyage into the lives of these brave and remarkable people. Esther and Kitty may be fictional characters but their arrival in Shanghai from Genoa and the years that followed are all loosely based around fact. Juliet Conlin brings alive the potent scent and smells of Shanghai, the poverty of both the local community and that of the immigrants, with a vivid narrative that is exceptionally powerful and heart-wrenching, compelling and fascinating. I’ve read a lot of WWII books set in England. My favourite aspect of these books is how people bond to get themselves through a hard time. I especially love the female friendships that come from these struggles. I found the exact same with The Lives Before Us and was really invested in what would come of the friendship between Esther and Kitty. I know some people might turn their noses up at another WWII book but this book doesn’t follow the same formula. I think a big reason for this was the setting in Shanghai. Admittedly, I knew nothing about Shanghai offering refuge for Jews during the war, and I knew next to nothing about the invasion of the Japanese, so The Lives Before Us opened up a whole new world to me. Now don’t get me wrong, because Shanghai was supposed to be some kind of refuge doesn’t mean that this book was any less dark than a WWII story based in mainland Europe. The struggle people went through to have a fighting chance at a better life was heartbreaking. In fact, there was one scene in particular that really got to me. On the liner, there was an elderly couple, the Rosenbaums. They try to sell a watch to Esther and Kitty and the desperation and embarrassment they go through for a little bit of money broke my heart. In fact, it was the Rosenbaums who brought the most emotion to the book. That is not to say that Esther and Kitty’s stories were any less sad. But Esther was a very strong woman and I had no doubt that she would be able to front anything out. Kitty was another strong women but not a very likable person, at first. She was quite frustrating in the choices that she made. Finally, I want to touch on how well Juliet Conlin made Shanghai come to life. In my mind, I lived in the city and could clearly see the richest areas down the areas with the most despair. This is done especially well with the inclusion of Wing, Kitty’s errand boy. Through Wing, we see how desperate Shanghai also was for the locals. Overall, although this was a book about despair and the struggle to survive, it is also very much a book about kindness, love and the power of community. A must read for everyone!